Match.com offers a 12-month plan for only $19.99 a month, a 6-month plan for $22.99 a month, a 3-month plan for $25.99 a month or a 1-month plan for $40.99. When you subscribe for a membership with Match.com, you’ll be able to communicate with all Match.com singles. You can message back and forth with users who have shown an interest in you, or send messages to users who you’ve liked the look of. You’ll get to see who has viewed or favorited your profile and keep count of all your open connections in one place – including those you've sent Winks and Likes to. You can also remove users you’re not interested in to make space for new possibilities. 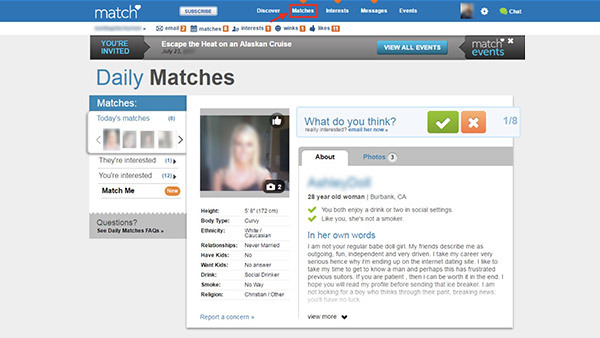 A new feature Match.com has recently rolled out is the ‘Missed Connections’ feature. This new location-based feature on the Match app allows users to see other members they have crossed paths with in real life. This is another meaningful way to try and merge together the online and offline worlds.